Do not write signs about the signs I write asking that signs not be posted…they will be thrown away daily if they have no name and date, though I don’t know why it must be dated, as we’re throwing them all out daily as it is. Yeah, just put your name on it…so we know who to laugh at as we toss your crap. 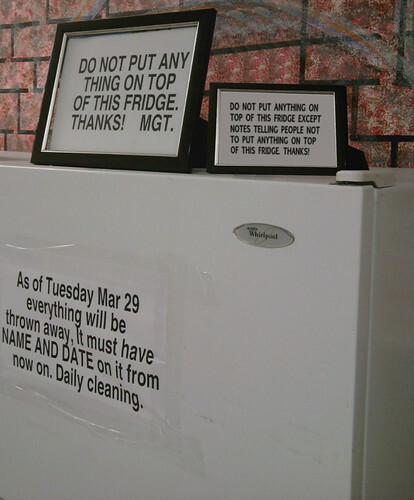 With the exception of this note, please do not put anything on top of this fridge cause as of March 29th EVERYTHING will be cleared out daily! We take pleasure in throwing away the food that you spend so much time naming and dating, and the PA notes you seem to keep posting despite our urgings for you not to. Thank you– MGT. With the last one, I would be so tempted to make yet another framed not excusing the previous notes. Oh, hello there, Ralph the Wonder Llama!! Watch out there, James Mason, you wouldn’t want The Elf to sack you…. I can so see this happening. Like looking at yourself in a mirror with a mirror behind you. One of my earliest barbershop memories. I thought infinity could be found in barbershops…I was a precocious child, until I tried walking into infinity. Then I was just a kid with a bump on his forehead. It might not have been infinity – perhaps altered consciousness – but it worked for Alice! They’re kind of like the “unnecessary” quotation marks. Note: Please do not post a post as a reply to this post. Thank You. Response: No, you don’t post a post about us not posting a reply to your post about your post. Thank You. The counter and counter-counter PA will escalate until that office collapses in on itself in a PAimplosion! Mandatory nametags, folks, unless you want to end up in the dumpster! You think this is bad? I worked somewhere that had that sign from the freezer door in the restroom. There were problems with things left there without names and dates? People, please, get with the program. Sign and date your poop. Just to mess with the person I’d put a date like 1800 because it doesn’t specify if the date needs to be current. That wouldn’t be thrown out. It would have Historical Landmark status. I’d probably go for something far in the future (2185, perhaps), guaranteeing that my stuff would not be thrown out. If it doesn’t yet exist, it cannot be thrown out. I would go with either one. Why not switch it up every day and do both? Better yet, use a different calender system. Put the date in a Julian numbering, the Hebrew Calender, or, why not, Stardates. Pope Gregory can shove it. And that is why I would spend the money to get my own damn fridge for my office. The Fridge Gestapo is the worst. Everything old is new again. I remember seeing “POST NO BILLS” on nearly every accessible wall in nearly every city I ever visited as a kid. It wasn’t until I was in my teens that I learned that “bills” was short for “handbills,” which, when not posted to walls, are called “flyers” because, being loose, they tend to get caught up in the wind and…fly. The More You…Knooooow. Team comma! Yeah, I always wondered what Bill did to be targeted so. The “No Standing” signs (for cars) – they always left me bewildered too. What if I just happened to be walking along the footpath, and without knowing it, I was standing under the “No Standing” sign? Would the sheriff come and arrest me? There was also a public awareness campaign against littering, whose tagline was, “Drop something, Sport?” For years I thought it was a counteractive imperative – They want me to stop littering, but they’re telling me to litter . . . and everyone else gets this, and I don’t . . . helppp! Guess I should have paid greater attention to the question mark. That sign on the fridge is far from informative. I mean, yeah put a date on it, but to what end? Does that mean as long as it has ANY date written on it, it won’t be thrown out? Otherwise, they should specify something like “food over a week old will be thrown out”. 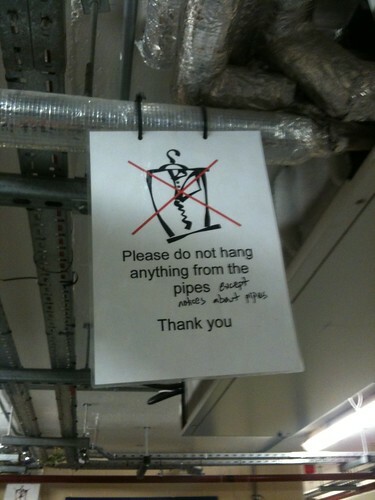 And no zoot suits in the boiler room. It could start a riot. it has been photo shopped…the smaller frame is an altered version of the first. the perspective on the inner metal edge is all off for a frames sitting at that angle and they both have the same scuff on the front right edge. sorry to be a kill joy. i can’t believe no one else pointed that out. How many notes would it take to fill the Royal Albert Hall? I would just start writing in different calendars and using symbols. I mean, they didn’t say it had to be in English, right? I recognized the second one immediately! Love my work’s break room!